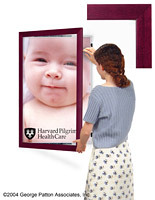 These Picture Frames Have A Swing Front And Cherry Finish And Display 24" x 36" Posters! These Picture Frames Are Available Online For Immediate Purchase! 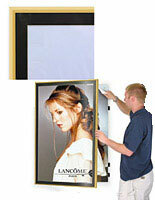 Mounting instructions and hardware are provided with this 24" wide x 36" high picture frame. 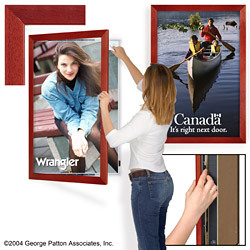 This picture frame comes fully assembled and is extremely easy to mount on your wall. This product is engineered for interior use only. 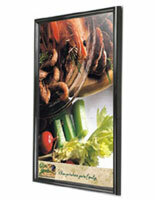 Your clients and workers will notice your media content when they are framed in this stylish swinging picture frame. 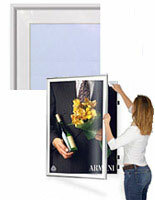 You will love its easy to use gravity latch system, which permits you to exchange posters often and with little effort. The exchange takes less than a minute because of the provided removable/reusable mounting tabs. 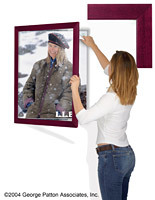 This Cherry finished wood frame gives your picture frame a high-end appearance. 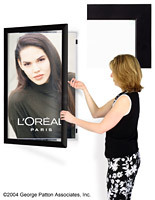 This unit is engineered for posters with dimensions of 24"w x 36"h. The outside dimensions of this picture frame are 25 3/8"w x 37 3/8"h x 1 7/8"d. The uncomplicated and useful gravity latch system remains out of view but keeps the frame securely closed.